Is it trite to speak of home? Cliché, maybe. But, home resonates.At the moment my home is in disarray. 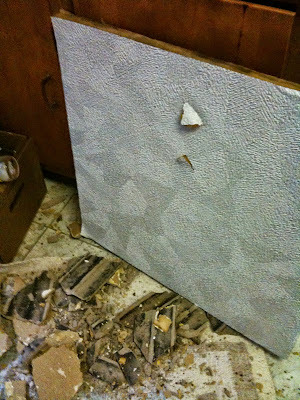 Case in point: last night, plaster from the ceiling crumbled and fell in hard portions on the kitchen linoleum. I did not wake up from the din, but I was startled in the morning (in between brushing my teeth and finding a perfect maroon tie) to find the kitchen bespectacled with jagged chunks of plaster. "Is there a rodent in my attic?" I asked myself, half startled and half bemused. Going from the ramshackle that is my apartment, to the structure of school, I enter another home: a weird conglomeration of bells and roving students, lecturing professors, and due dates, exams, lunches and recess. School is a strange form of home that merely serves as another version -- but for me, a strange anodyne -- and I cringe to confess this fact, because one's vocation is not supposed to be one's home. Do I find myself grading papers, only to look at the clock notice it is already six o'clock? This is the tragedy of home as school. Alas, my life is fail. Or, as one of my students would say, "Epic Fail! I hate my life!" So, today, to rectify this unhappy occasion, I set out to spruce up my "home" and make sure next week I will not end up sleeping at my professor's desk. My task before me is to make my home the same as it was in August. I notice the pile of dishes hidden beneath the shorn plaster. I notice books unread. And OMG! I have to complete those homework assignments and finish reading those essays. I stop for a second, in the middle of writing this first installment of an alphabiography, which I have decided to impose on myself as an assignment -- I figure if I am making my students complete this project, I might as well do the same -- I have until October 15th -- eeekkk and I probably have loads of grammar and spelling mistakes. Is there anything here that is home? True home? Not artificial or cliché home? The sound of the streetcar whizzing by frequently and hurriedly? Is it the fresh pot of coffee I worship every morning -- to quote Anne Sexton -- "All this is God, right here in my pea green house." Home is an unhurried thing. 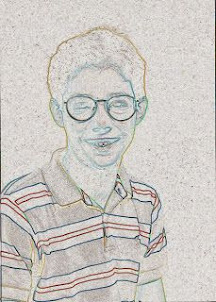 Is it metaphysical? Probably not. Is it the edifice of a house? Or is it the collection of a family? The association of friends? I know one thing is true: home is unequivocally the evocative longing to diminish the alone. It is the wish of the solitude to unite with the One. It is the prayer of the worshipful to unite with their God. It is the hope of the teacher to successfully complete one more successful assignment; it is the proper buttering of the toast; the perfect rendering of prose into poetry, the sublime nature of one's hope (albeit striving) for ? ... and that is where I stumble ... lost again in the mystery of home. I do have one final concrete image for those out there who detest abstract thought. The apple pie Americans who need a palpable definition. Home is where the heart is? Home is on the range. Home is for breakfast. Home fries. Homie. Dog. G. Out. Life Lesson: Home is what you make it. Ahh, isn't that trite enough? But, I think I will go and wash those dishes (yeah, right he says). Well-written, my dear friend. I would like to propose that home is the one place where one feels safe, loved, etc. Home is where you feel free to let down your defenses (unless you are a charter member of the NRA.